Genesis Entertainment proudly presents Sean Luke Spiteri 'Tiger Man'. Melbourne based Tribute Artist Sean Luke Spiteri has been electrifying audiences for over 16 years. His high energy presence, charisma and passion on stage has brought him much success. His moves are the sharpest in the country and his strong Elvis vocals along with Sean's authentic Elvis wardrobe is a dynamic combination to witness live. Sean truly captures Elvis at the peak of his career. His success as one of Australia's leading Elvis tribute Artists has taken him from Australia to the USA. Sean is a multi award winning Elvis Tribute Artist and was ranked top 29 worldwide in both 2012 & 2014. Giving Sean the opportunity to perform in Memphis Tennessee, Elvis Presley's hometown. Since then Sean has played sell-out shows across the country and headlined some of the biggest Elvis festival in Australia. Sean Luke Spiteri 'Tiger Man' is a non-stop electrifying concert production backed by live musicians. Sean Luke Spiteri is known for his authentic wardrobe. This particular jumpsuit named ' Tiger Jumpsuit ' or the 'Mad Tiger' was hand made by Elvis Presley's embroidery designer Gene Doucette especially for Sean Luke Spiteri. This piece took over a year to make and now it is the closest Jumpsuit to Elvis Presley's 'Tiger Jumpsuit' you will ever see. With the belt, rings & accessories to match fans will have a rare opportunity to see Sean Luke Spiteri and his Tiger Jumpsuit live in action. Elvis wore this suit during 1974 and Sean will be singing songs from this Iconic period in Elvis Presley's Career. 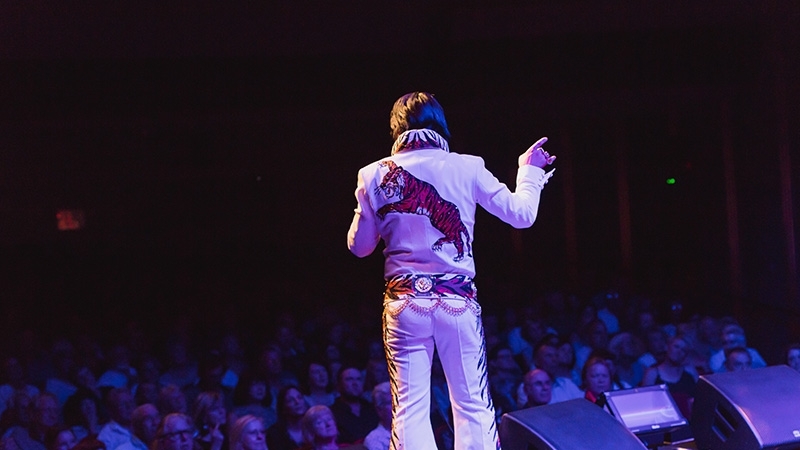 Don't miss your chance to see this stunning jumpsuit live in action for 'ONE NIGHT ONLY' here at The Parkes Elvis Festival.